The original Kir Royale was made with white wine and simply called Kir Aperitif - Champagne is (in our opinion) much nicer and sexier! A vibrant, easy to drink and very light Cocktail full of bang and opulence; it is simply a wonderful and 'goes down easily' -type of Cocktail. The Crème de Cassis is a blackcurrant liqueur that adds sweetness and body to the drink. Ideal for Weddings, outside parties or if you just would like to 'add' something to Champagne (if you are not a Champagne lover). An ideal Cocktail to serve with canapés and light food. The key to a fantastic Kir Royale is a good quality Champagne and it being served really cold. 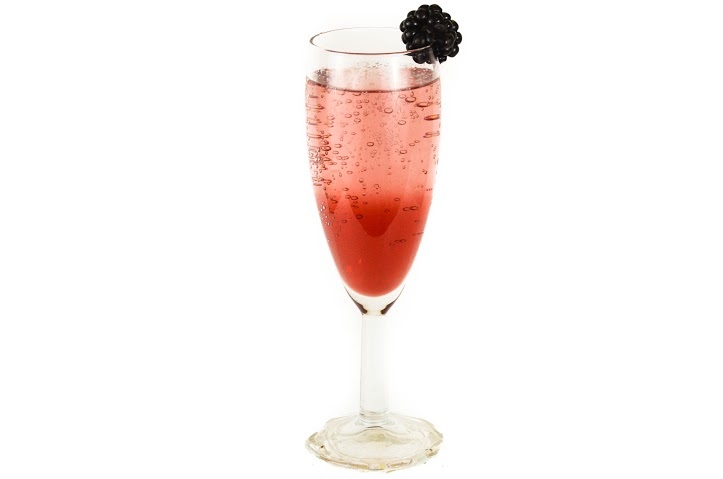 Bubbly always puts guests at ease - a sophisticated and beautiful Cocktail designed for outside parties and basking in the sunshine - well worth adding to your list. It is said the first Kir Royale was created in 1904 in Dijon at the legendry café George which sadly is no longer. The original drink was named after Canon Félix Kir - a French Catholic priest, Resistance fighter in World War II and a local politician. During the war it is claimed he helped some 5,000 prisoners of war escape from a local prison camp at Longvic. He was made a knight of the legion d'honneur for his heroic actions in 1945. In 1945 he was also elected Mayor of Dijon at the age of 69 - and stayed in this position until his death in 1968 at the age of 92. It is said he always served visiting delegations to Dijon a local drink called, 'blanc-cassis''; a concoction of white Burgundy wine with Cassis (a Blackcurrant liqueur). This tradition became so engrained in locals that it eventually became known simply as Kir in honour of him. The Royale was added for prestige and pomp. Champagne glassware stretches back to the early 1700's when most drinking vessels were either made of wood or metal. As the centuries rolled by glassware developed and redesigned. Champagne was for many decades drunk out of Coupe glasses- big wide bowls where the bubbles of the Champagne could be seen magically escaping from the bottom of the glass. As our knowledge and technology developed, we realized the shape of the Coupe glass aided the Champagne to go 'flat' with the beautiful fizz disappearing fast; de-carbonization the scientists would call it. The Champagne Flute - a conical, slender and tall glass was developed in order to keep as many bubbles flowing as possible plus the aroma of the Champagne is channeled in a small area - up and into the drinker's nose.